For those who remember 'the way it used to be' this cottage will bring back fond memories of days on the bay. One of the original block houses from the '50's, this cottage features old iron beds with comfortable quilts, a boat-shaped fireplace, a sidebaord full of fiesta ware and a vintage pink tiled bathroom. 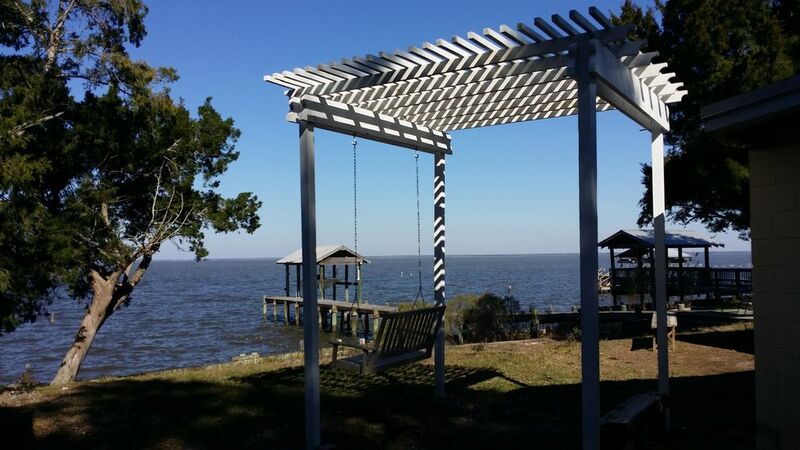 The pier is just right for fishing and crabbing and kids will enjoy the tree fort across the street. From this quiet out of the way street you would never guess that Gulf access is just a two minute drive away. The Bon Secour Wildlife preserve access offers free parking and a boardwalk over the snow white dunes. Not as crowded as the beaches up in town this pristine area is great for shelling, surf fishing, walking and sunning. Golfer's Paradise: Who could ask for more than a beach house and top of the line golf courses! The Peninsula Golf Club is located just four miles East. It features 18 holes, a pro shop, and restaurant. In addition you will find tennis courts and a swim fitness center. If you want to change things up a bit try the 36 holes of Pure Palmer Golf at Craft Farms, Cotton Creek, and Cypress Bend just a 15 minute drive away. Want more? Play Kiva Dunes or the Golf Club of the Wharf; both are just five miles away. Shopping: Ten miles north of Gulf Shores in Foley, Alabama the Tanger Outlet Center features 120 name brand shopping options for the bargain hunter. Brooks Brothers, Calvin Klein, Osh Kosh, SAS, Gap, Banana Republic, Anne Klein, and more. Once you are finished there try the numerous antique stores in and around the area. Gulf Shores and Orange Beach have numerous shopping venues for those looking for special items to take home as a reminder of their days by the sea. Recreation and Special Events: The City of Gulf Shores has a fantastic recreation center with daily, weekly, or monthly rates. It features an indoor temperature controlled swimming pool, basketball courts, fitness room, indoor track, ping pong and pool tables, water aerobics, yoga and other fitness classes. In the winter the city's Special Events Department sponsors an outstanding series of performances. Information can be found at the city website. History buffs will love historic Ft. Morgan just 11 miles west When you are finished there catch the ferry to Dauphin Island to see its sister Ft. Gaines or visit the Dauphin Island Sea Lab. Great fishing in Mobile Bay at Shell Banks reef. Bring your boat and tie up just in front of the house. Fish, crab and throw your nets right from the pier. Property borders both the bayou and the bay. Small dogs may be allowed with additional fee. Please ask. Check in 3 p.m. Check out 10 a.m. The cottage was exactly what we needed to get away from the Northern cold. Fished, crabbed, watched birds and even saw dolphins! Most of all..relaxed! Another great visit to Lantana Cottage! Our second winter stay at Lantana and as enjoyable as the first! The cottage, location and neighborhood are perfect for us and we're booked for next year already. Love working with Martha! We truly enjoyed our stay. Our plan was to fish through the Thanksgiving Holiday. The cottage was perfect! We had to put our Thanksgiving meal on hold as we watched our daughter pulling in a 25 lb red fish from the dock. Then the last evening there we were excited to see her husband pull in a 21 lb red fish from the end of the dock as well. We caught other red fish, grouper, stingrays and crabs also that weekend. The cottage was so spacious and relaxing but we mainly spent our time outside on the dock or porch. I can see with all the trees and breeze from the bay how this would probably be fairly cool even in the heat of the summer. And there is a beautiful white sandy beach less than a mile away that isn't littered with condos. We also had the enjoyment of watching a dolphin swim just off the end of the dock the first day there. The cottage was well stocked with anything anyone could want or need. We are definitely planning on a return trip! Oh and the pelicans and squirrels will definitely keep you entertained. We loved Lantana cottage, can't wait to come back. It reminded me of trips to my grandparents lake house. Great location being 15 minutes away from beach. This little cottage is the perfect spot off the beaten path. My husband, our 2 kids (5 &9), our little pup and I had the best time. The kids loved the treehouse across the street and we throughly enjoyed being able to walk ou in the dock and fish or crab when we wanted! We were here the week of hurricane Michael which thankfully did not come our way but it did bring a couple windy days and beautiful breathtaking sunsets. The house is the perfect mix of nostalgic beach comfort with everything we needed. The beds were comfy and the location was perfect. We like to be off to ourselves and away from the commercialized crowds of the beach. Just a few miles down the road was access to the pet friendly beaches where our little pup was able to enjoy himself. Definitely check out Sassy Bass amazing grill just down the road for breakfast and dinner and of course, tour the fort just at the end. Martha was very kind and accommodating. We would love to stay here again should the opportunity arise!